Part 1, Getting Started is here. Part 2, Finding and Reading emails is here. Part 3, Replying to an email & Saving a Contact is here. Part 4, Composing an email & inserting a smiley is here. Warning! Some of the screenshots and step-by-step instructions appearing in Part 5 are only applicable to Windows 7. 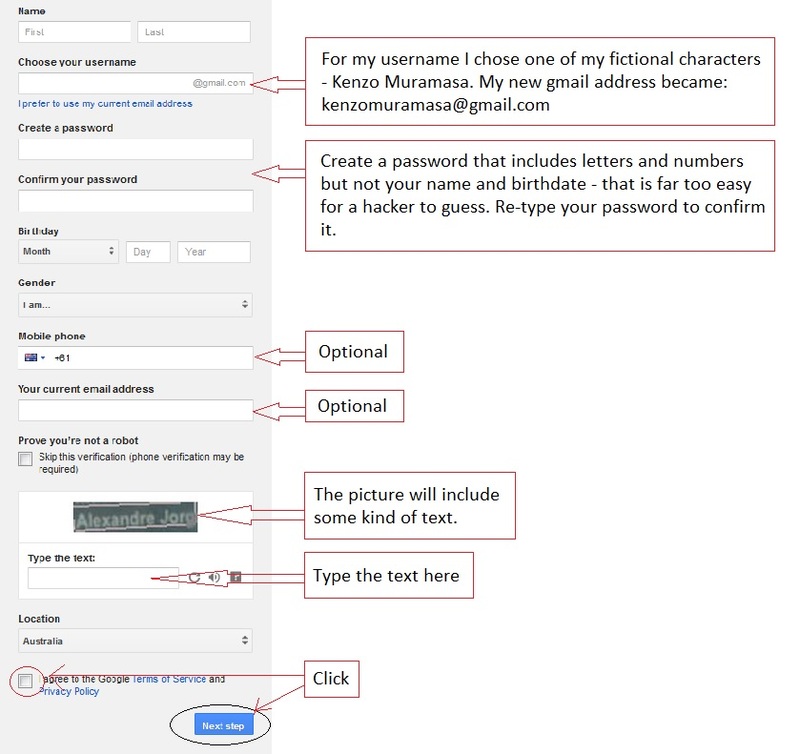 The screenshots and instructions pertaining to Gmail – i.e. 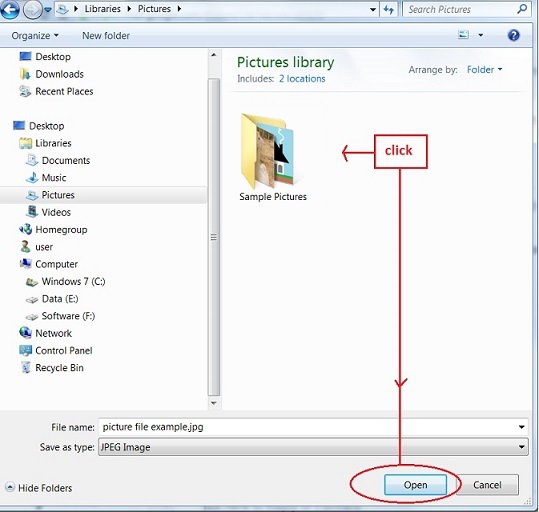 how to open an attachment – will be the same for everyone, but the instructions for finding a picture on your PC [in order to attach it to an email] will only be relevant to Windows 7 users. This is because people using other operating systems – such as a MAC or Windows XP, Vista, or one of the 8’s – may not see the same things on their own PCs. 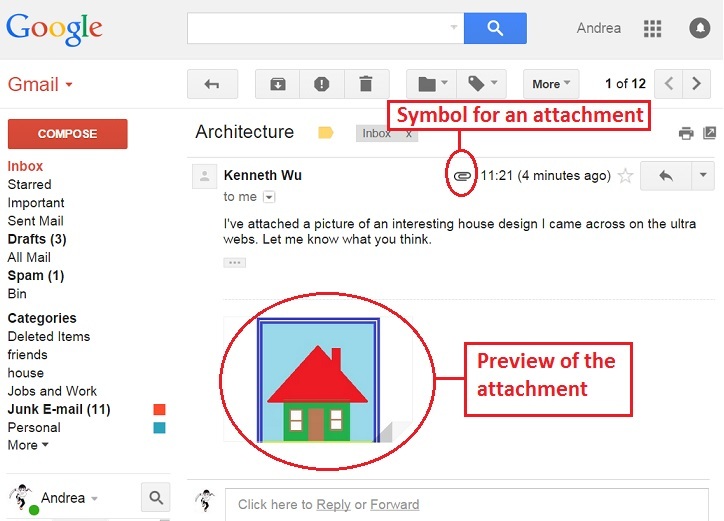 Attachments are simply files that you send along with your email message. Most of these files cause no problems whatsoever, but some hackers will use attachments to sneak viruses onto your computer. These viruses are triggered when you ‘open’ the attachment. For this reason, ALL attachments should be treated with caution. When I first started browsing the internet I thought I would be safe from viruses because, well, you know, how would a hacker even know I existed? It was not as if I was someone important. What I did not know was that hackers do not care about me personally. In fact, they do not target me at all. Quite simply, hackers throw out huge, baited nets and wait to see what bites. And yes, my PC did get infected. does the sender [someone I do know] sound a bit odd – i.e. is the email a generic sounding one-liner such as ‘hi, thought you might like this’ or something similar? If it is, I’ll delete the email and the attachment first and apologise, if necessary, later. This lack of certainty when it comes to attachments brings me to a bit of netiquette – if you are sending someone an attachment, it is a really good idea to tell them about it in the email message itself. It’s a small thing but will reassure the recipient the attachment is safe to open. As a general rule, however, I will never open an attachment if the filename ends in ‘.exe’ or ‘.zip’. [Note: for a description of filenames, see ‘How can you tell what’s a picture file and what isn’t?‘ below]. There are exceptions to this rule of thumb, but beginners should probably delete first and ask questions later. So what attachments are safe to open? Picture files are generally safe to open, unless there is something else suspicious about the email – e.g. it’s from someone you’ve never heard of, or promises something unsavoury. How can you tell what’s a picture file and what isn’t? Like people, files have a ‘first name’ and a ‘family’ name. The ‘first name’ describes what’s in the file while the ‘last name’ describes what kind of file it is – i.e. one of the picture files, a text file, a music file, etc. 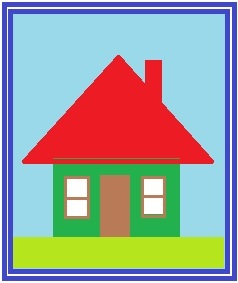 ‘.jpg’ = the family name of the file – i.e. what type of file it is. 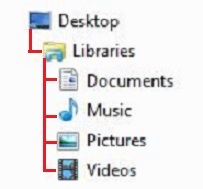 In computerspeak, this part of the file name is called the file extension. 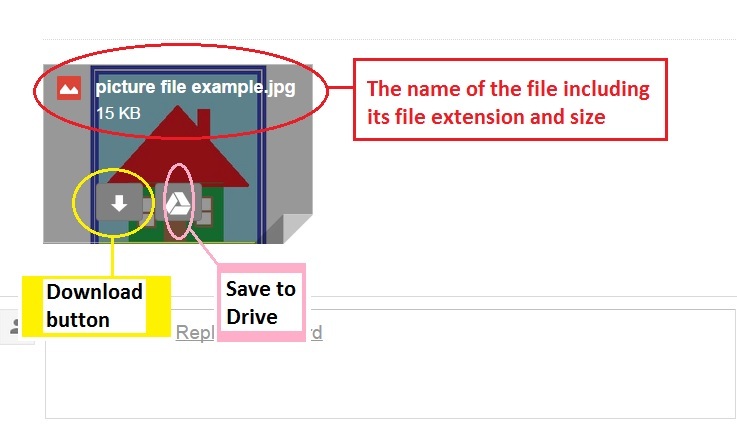 The file extension tells the computer how to handle the file – i.e. as a picture file rather than, say, a music file. 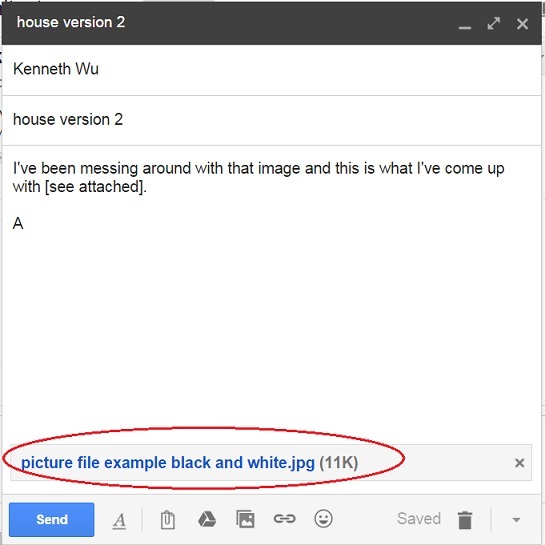 If you get an email from a friend, and if the attachment in that email ends in any of the above file extensions, the attachment is safe to open. This overlay shows the full filename of the attachment, including its file extension which tells me it is a picture file. Also of interest is the ’15 KB’ which tells me how big the file is. The overlay also contains the buttons for two options – Download and Save to Drive. 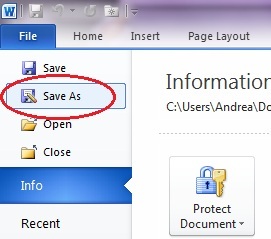 Clicking this option will save the file to Google Drive [a storage area in the Cloud]. This option is not covered in the Beginners guide. Clicking the ‘Download’ option will copy the file from the email and save it to my own PC. Once the file is on my PC, I can do whatever I want with it. This is the option we will be exploring. When I click the Download button [in Windows 7], the screen changes to display the last location at which I saved something. 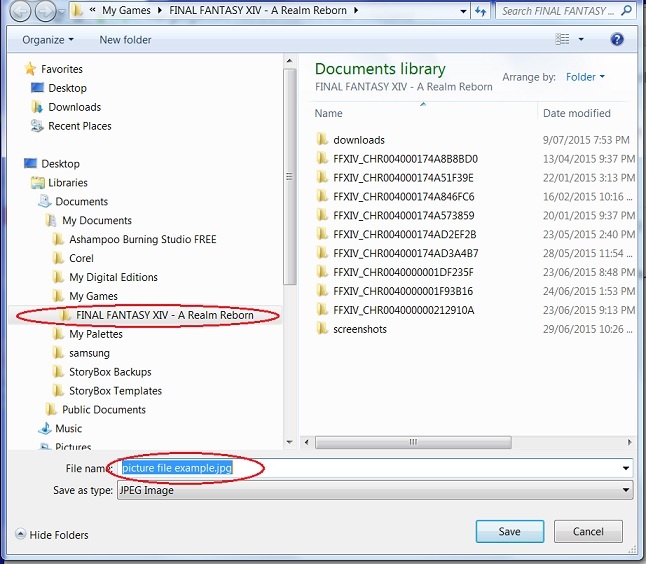 In the example below, you can see that it was in ‘Libraries, Documents, My Documents, My Games, Final Fantasy xiv – A Realm Reborn’. This is not where I want to save the attachment. 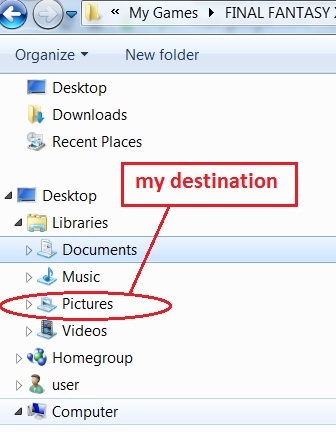 The easiest way to open the folder is to click on the ‘Sample Pictures’ icon once. This will highlight the icon, and it will cause the ‘Save’ button to change to ‘Open’ [as shown above]. Now all you have to do is click the ‘Open’ button. Once ‘Sample Pictures’ opens up, the ‘Save’ button reappears. Click the ‘Save’ button to save the attachment to this location. 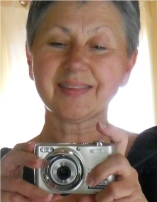 Naturally, I want to share the new picture with Kenneth so I compose an email to him [see Part 4]. Before I click the ‘Send’ button, however, I click the small ‘Attach Files’ icon shown at the bottom of the compose form. 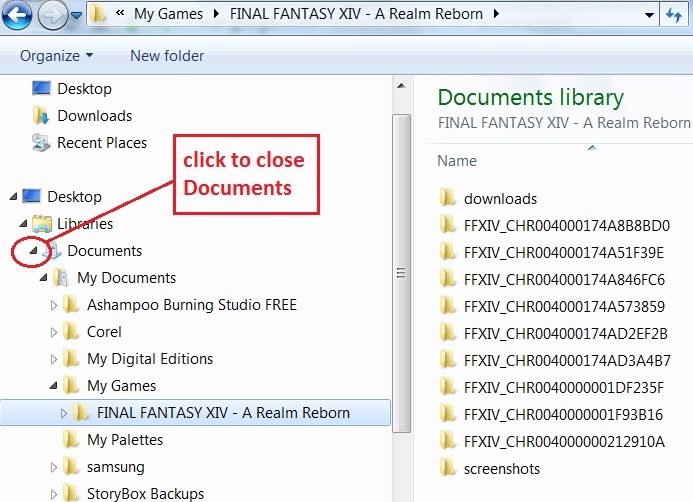 This screenshot is almost identical to the one we saw before…except that in this one, the image peeping out of the folder is of the edited house. That’s because I saved the edited file to the same location as the attachment. Clicking on an image displays information about it, including its dimensions and size. You will also see a much larger preview of the image. When you are sure you have the correct image, click the ‘Open’ button as shown. Click the ‘Send’ button and that’s it. As always, Gmail will display a yellow confirmation message telling you your message has been sent. If you click the ‘Insert Photo’ button, you will be given the choice of inserting an image as an attachment or as an inline picture. 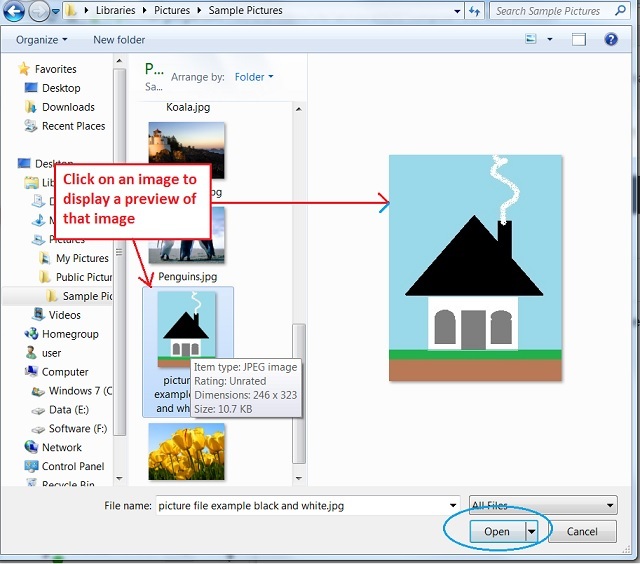 the recipient cannot easily download the image onto his/her own PC. It can be done, but not in a straightforward way. If I ever do an Advanced Gmail how-to [shudder], I will include the ‘Inline’ function, but given the unfinished state of Gmail at the moment, I don’t see that happening any time soon. I did not intend to review the new version of Gmail, but after a month of working on it for this series, I can honestly say I am not impressed. I had to work around certain key functions – like Contacts – because the interface was so poorly designed and/or implemented. And even the Inbox functions leave a lot to be desired. Too much is hidden, making not-so-advanced functions hard to find, hard to use and hard to explain. 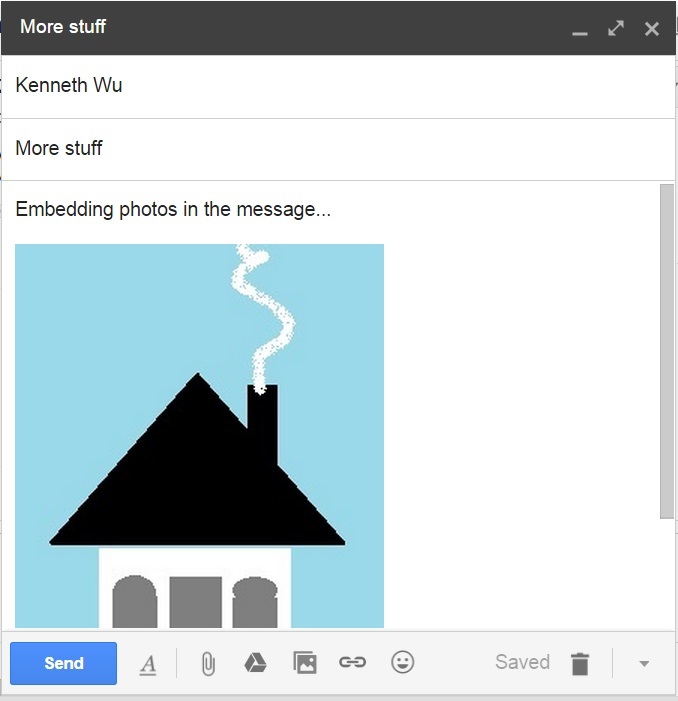 In many ways, the new Gmail reminds me of Windows 8. There too, key functions were hidden, or implemented in ways that were not at all intuitive. And people hated it, myself included. I truly believe that function should never be subordinated to form. I don’t care what something looks like so long as it works. 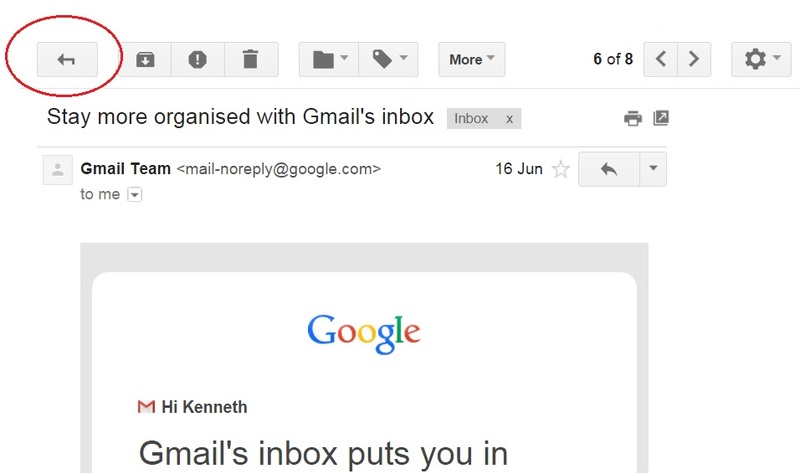 Sadly both the new Gmail and Windows 8 placed form well and truly over function. To be fair, I understand that mobile devices have made it necessary to simplify all applications in order to conform to the new ways of doing things, but we have not yet reached the point where serious work is done on those devices. Imagine trying to write your magnum opus on your mobile phone! Or if that’s not your style, imagine trying to create a complex spreadsheet on your phone. Mobile devices are simply too limited for the kind of work we currently do on desktops or laptops. Therefore it does not make sense – from a user’s point of view – to reduce everything to the common denominator of the mobile device. Yet that is exactly what Windows 8 and this new Gmail are attempting to do. Although replying to an email and composing one are very similar, the few small differences can be tricky, and they all involve your Contacts. 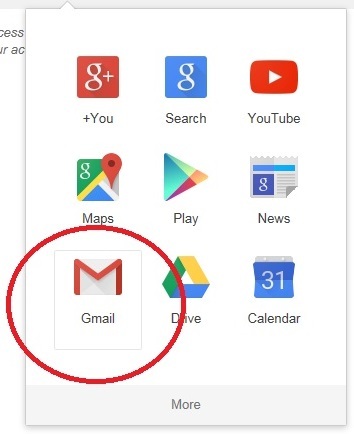 If the email address of your Contact is already known to Gmail – i.e. you have already saved it [as detailed in Part 3], composing an email will be easy. However, if you want to send an email to someone brand new, you will have to type their email address in from scratch, and that could cause problems if you do not do it properly. The three examples shown are just the tip of the iceberg in terms of typos, but they do demonstrate how precise an email address must be. This is one very important reason for saving Contact details when you reply to emails. You should now be looking at the ‘New Message’ pop-up. Notice how the blinking cursor is in the ‘To’ field? This means it is ready for you to type the email address. 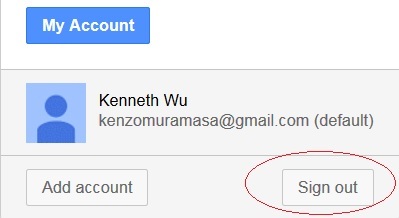 After you have finished typing in the email address, click in the ‘Subject’ field and type in a short description of what the email is about. Leaving the Subject field blank could make some spam filters think your email is junk, or malware, so it is always a good idea to type something that makes sense. 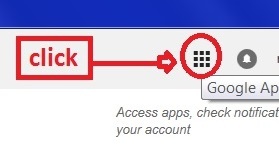 Click the big blue ‘Send’ button down the bottom of the message form as shown above [circled in red]. You will get a bright yellow confirmation message from Gmail to let you know your message has been sent. As always, Gmail provides more than one way of doing something, and entering the addressee of your email is no exception. Click the ‘Compose’ button. Once the ‘New Message’ form pops up, start typing the first few letters of the email address you wish to use. The first match shows the email for David Prosser [because the letter ‘b’ is the first letter of the actual email address]. The second came up with Honie Briggs [because the letter ‘b’ appears in Honie’s surname]. 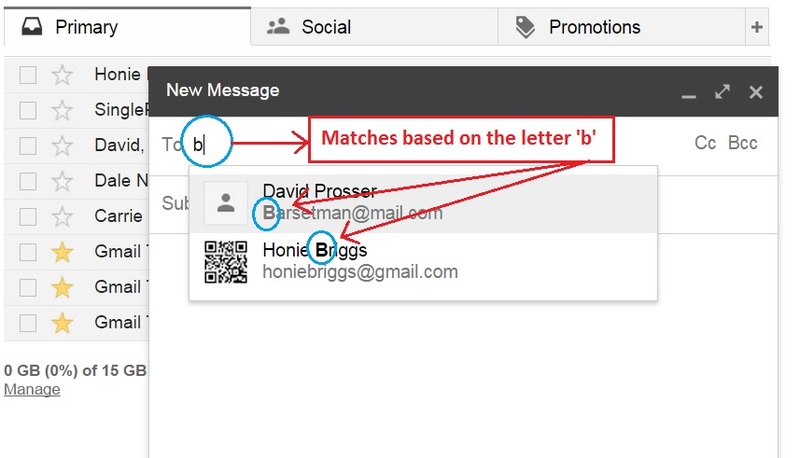 Notice how Gmail inserts the name of the addressee rather than the actual email address? This is an easy way to check that you are, in fact, sending the email to the right person because ‘Barsetman@mail.com’ could be anyone. This method is particularly useful if you know someone is in your Contact list but you can’t remember anything about their email address – i.e. you can’t just start typing something and expect Gmail to come up with a reasonable match. In the following example, Kenneth wants to send an interesting quote to one of the three new contacts he has made. He remembers that she liked quotes, but he can’t remember her name or email address. What that rather cryptic message means is that you should click on the word ‘To’ in order to select a contact[s] from the list of available contacts. 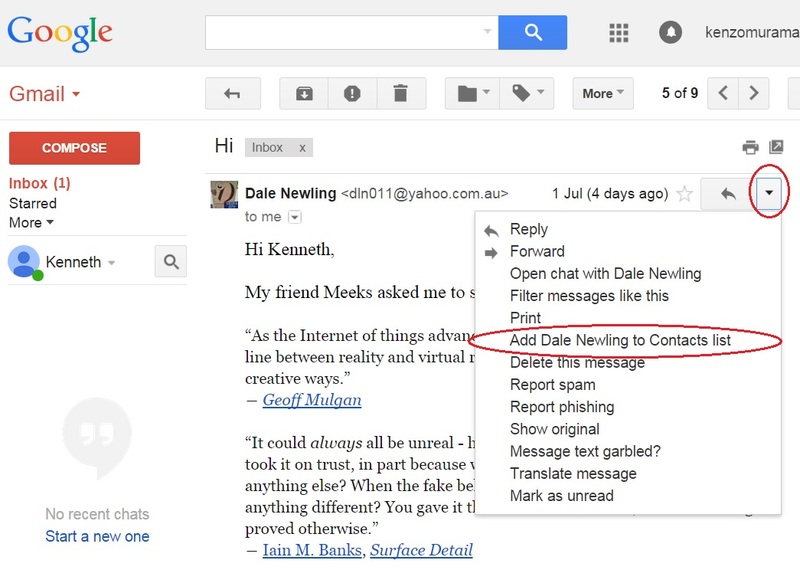 When Kenneth looks at the list of Contacts, he sees the small graphic [picture] next to the name of Dale Newling and remembers that she is the one who sent him all those interesting quotes. Once Kenneth clicks on ‘Select’, the email address for Dale Newling is inserted into the ‘To’ area of his email and he is ready to type a message. Before Kenneth hits the blue ‘Send’ button, however, he wants to insert something into the email, something fun, like a smiley face. 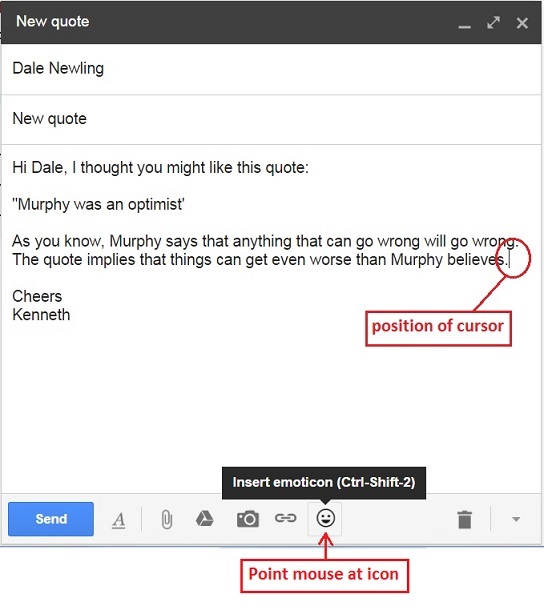 To insert an emoticon into your email, simply click on the image you want and it will immediately appear at the spot where you left your cursor [or as close to it as possible, space permitting]. As the following screenshot shows, you can insert as many emoticons as you wish. In Gmail for Beginners, Part 5, we will be looking at how to insert something more serious than a smiley face into an email. 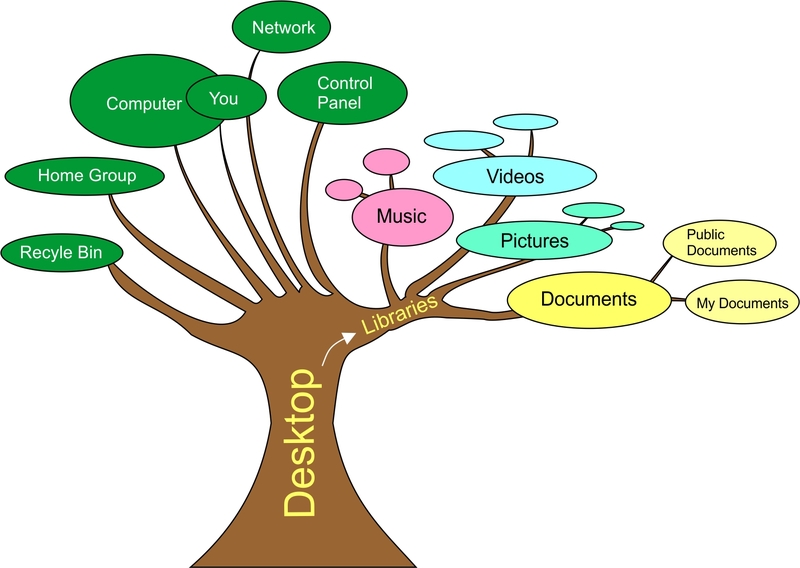 We will be attaching files and pictures located on your own PC, so you will need to have some knowledge of how to find your way around the files and folders of a PC. 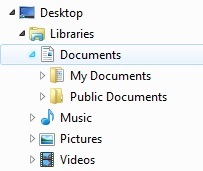 If you need some help, my post about basic folders in Windows 7 can be found here. 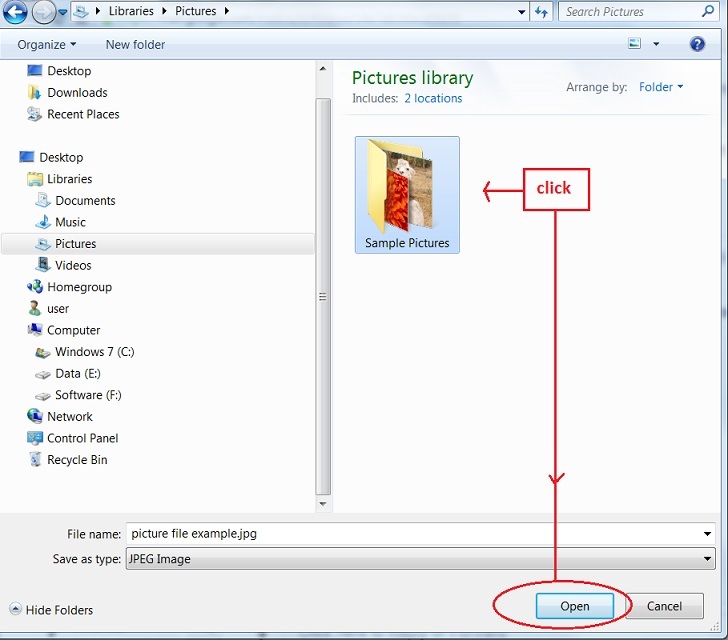 You can find Part 5 – opening an attachment & attaching a picture [Windows 7], here. Part 2, Find and Reading emails is here. Now have a look at the ‘date received’ column. All the emails are displayed in date order with the most recent one [from Honie Briggs] at the top of the list. Notice that Honie’s email does not have a date next to it. Instead, it has a time-stamp. This indicates the email arrived during the current day, hence no need for a date. By tomorrow, it will show a date like all the others. And now to the emails themselves. As Kenneth looks at the sender of each email, he realises that he only knows two of the people who have written to him – Single Pixel and David Prosser. Single Pixel is an old friend from university days while David Prosser is both friend and mentor. Unable to face the sympathy of an old friend, Kenneth reads the email from Single Pixel and then ‘stars’ it for later. In Part 2 you learned how to star an email while it was sitting in the Inbox list. Now you will learn a more intuitive way of starring an email – from within the email itself. A drop-down list will appear. Click the ‘Add star’ option as shown above. After starring the email from Single Pixel, Kenneth returns to the list of emails by clicking ‘Inbox (4)‘ in the navigation pane. The (4) indicates that there are only four unread emails left. 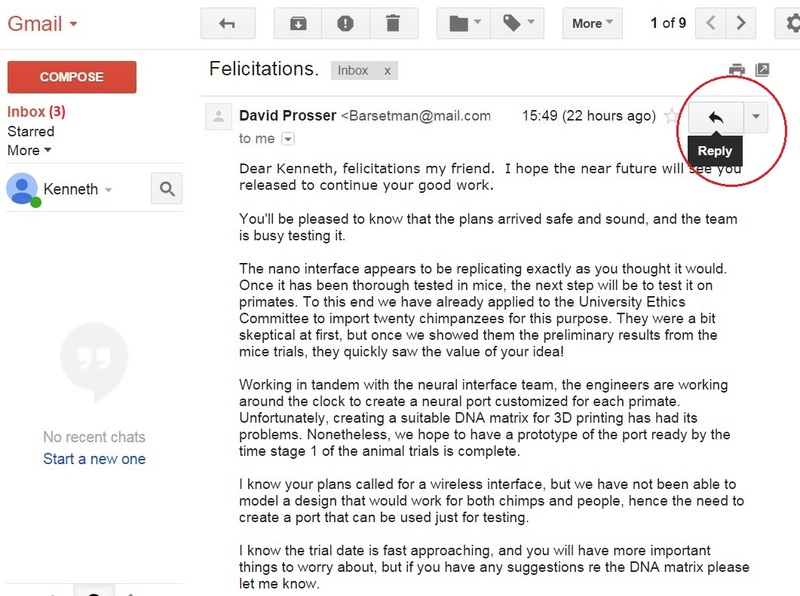 From those emails, Kenneth clicks on the one from David Prosser who, along with his team of dedicated researchers, is working to make Kenneth’s dream a reality. 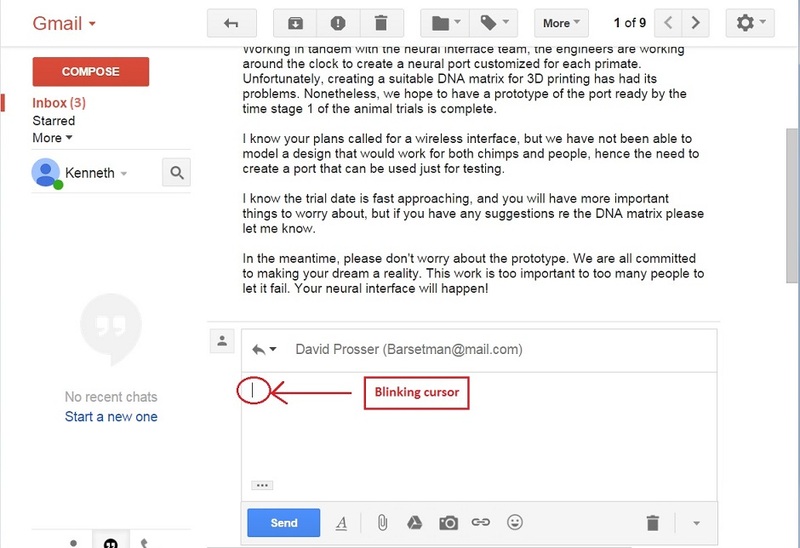 Clicking the ‘Reply’ button takes you to the very end of the email and displays a text box [for typing in your reply]. Notice that the cursor is already inside the form, ready for you to start typing. When you have finished typing, click the bright blue ‘Send’ button as shown above. Kenneth now has three more emails to deal with. All three are from friends of his friend Meeka and are clearly from kind, generous people, exactly the sort of people he would want to keep in contact with. He decides to add all three to his contact list. By a strange coincidence, Kenneth discovers that Gmail provides a different way of saving the contact details of each of his new friends. 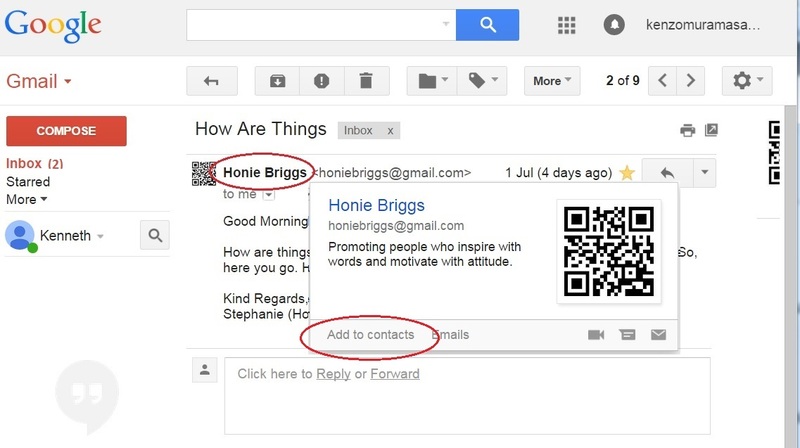 Gmail displays a small pop-up with information about Honie Briggs as well as some options down the bottom. One of those options is ‘Add to contacts’ [circled in the screenshot above]. Clicking the down arrow causes Gmail to display another small pop-up. This one contains a long list of options, but the one of interest to us is about half way down – ‘Add Dale Newling to Contacts list’. After clicking the option, Kenneth is presented with yet another yellow, confirmation message. This is exactly the same pop-up that appeared when Kenneth saved Honie Briggs to Contacts. 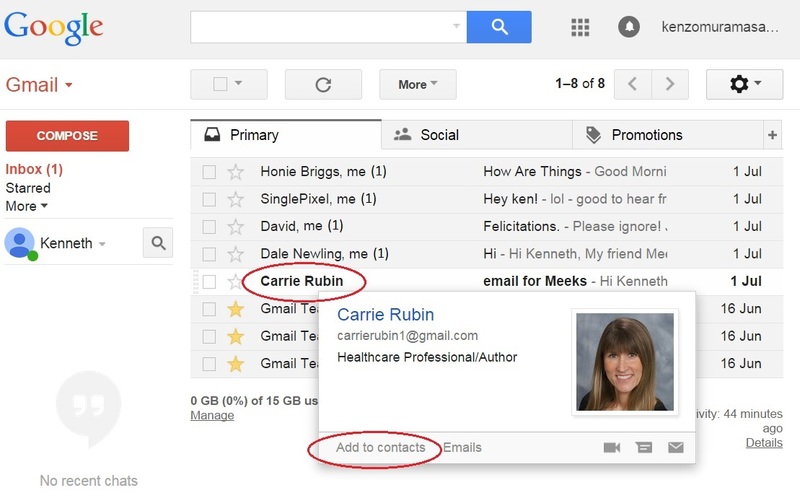 Clicking on the ‘Add to contacts’ option [circled in red], Kenneth saves Carrie Rubin’s details to Contacts and is presented with the same, yellow confirmation message as before. Exhausted from his labours, Kenneth decides to take a nap while I thank my friends – Honie Briggs, Single Pixel aka George, David Prosser, Dale Newling aka EllaDee, and Carrie Rubin – for their time and generosity! If you missed Part 1, Getting Started, you can find it here. In the past, when you received emails they would all be lumped into one place – the Inbox. From there, you, the user, would have to sort through all kinds of unwanted emails to find the few gems, i.e. the ones from friends, family, work or personal interests. Then spam filters came along, whisking away the most obvious ‘junk’, but this still left your inbox full of things that were not quite junk – like newsletters that you might read once in a blue moon, or notifications from online retailers confirming things you had bought, or advertising material from websites you once visited – but not high priority either. And you still had to sort through it all yourself. 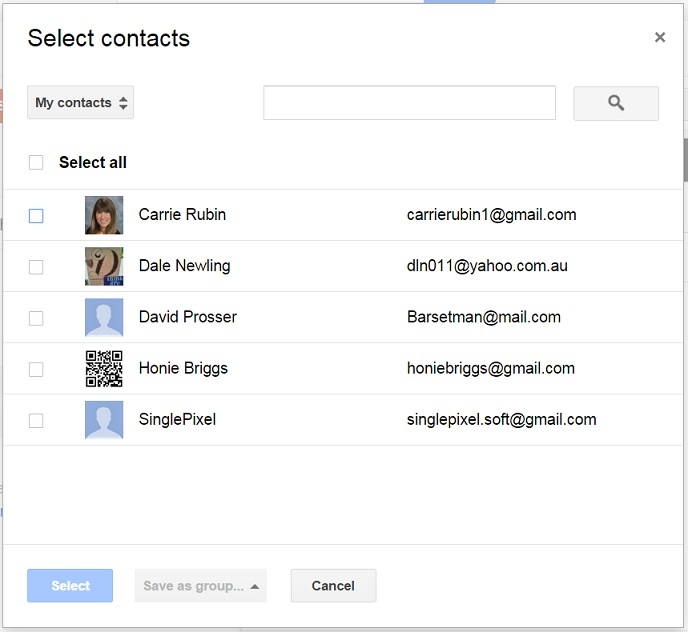 Now, Gmail has attempted to change all that by automating the sorting process. Instead of lumping everything into the one Inbox, it automatically sorts incoming email into preset categories which are then displayed in separate pages called ‘tabs’. Like the cardboard dividers in a physical folder, Gmail tabs organize information into logical groups, but unlike ordinary dividers, you do not have to lift a finger. To move from tab to tab, simply click on the name. What is in each tab? 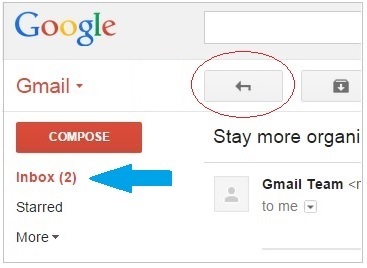 Although only three tabs are shown, there are in fact five Gmail tabs – Primary, Social, Promotions, Updates and Forum. Forum contains emails from online groups, discussion boards and mailing lists. Updates contains emails that may include confirmations, receipts, bills and statements. Promotions contains emails from commercial websites you have visited. It can also include paid advertisements. Social contains email notifications from social media sites such as Facebook, Twitter etc. Primary contains emails from friends and family etc., as well as anything that does not belong to any of the other tabs. How can I see the other tabs? By default, only the Primary, Social and Promotions tabs are displayed when you first start using Gmail, but it is very easy to change which tabs you see. You can even choose to see all of them at once. As you can see, only three of the five tabs have been ticked, but you could have all five displayed at once. 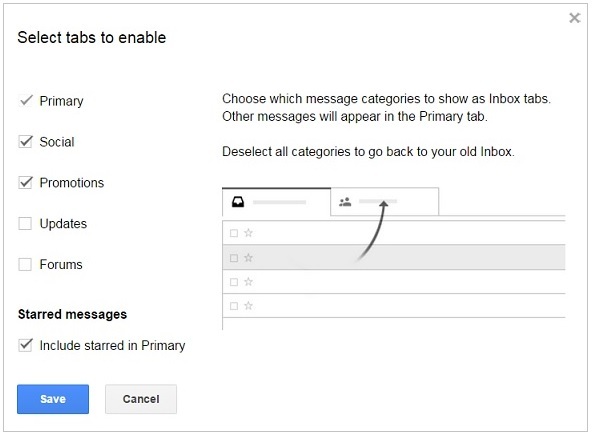 If you did, Gmail would automatically sort all incoming emails into those five categories, and you would not see those emails unless you opened the relevant tab. This level of automation would certainly make your Primary tab less cluttered, but it would also mean that bills and other important notifications would be hidden away in the Updates tab – out of sight and out of mind. If you forgot to check that tab regularly, you could easily miss paying an important bill. Of course, having all your bills grouped in the one location might also make them easier to pay. At the other end of the scale, if you de-selected every tab except Primary [which cannot be de-selected], Gmail would stop sorting your emails entirely. Instead, every incoming email would be displayed in the Primary tab. Now, this might not sound too bad when you receive only a few emails each day, but when the flood of promotional material finally begins, important emails could easily get lost, hidden in full view like a needle in a haystack. Luckily, the Gmail tabs do not have to be all or nothing. You could, for example, select only the Promotions tab. This would mean that all advertising material would be taken out of the Primary tab and placed in the Promotions tab where you could read it or ignore it with impunity. Everything else would be displayed in your Primary tab. This solution would be perfect for those who know they are likely to forget to check the other tabs, or those who prefer to remain in control of their emails. Given the amount of promotional material that I receive every day, I would strongly recommend keeping the Promotions tab at the very least. To de-select one of the existing tabs, simply click inside the tickbox next to its name. To select one of the other tabs, again, simply click inside the tickbox next to its name. The tickboxes toggle on and off like a light switch. Once you have selected which tabs to use, click the ‘Save’ button. The body of the email, i.e. the actual content, is in the middle of the screen. You can scroll up and down to read the entire email. But now what? How do I get out of an email? 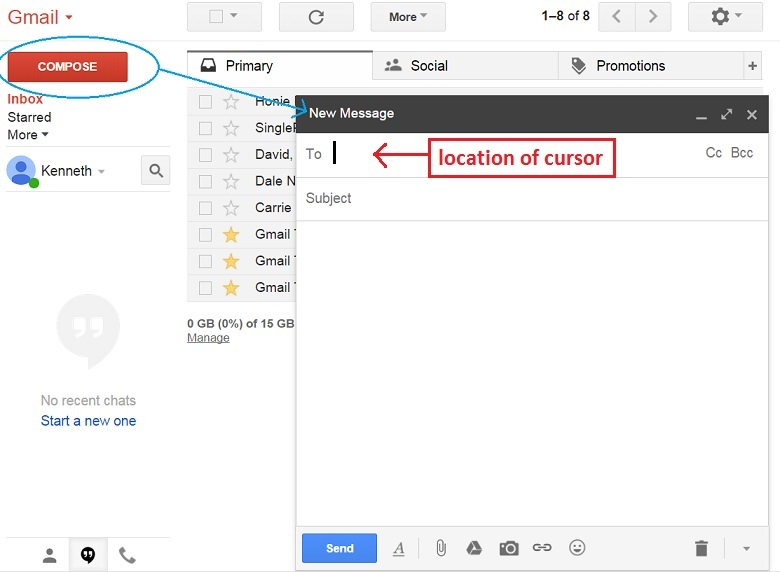 The easiest way of getting out of an email is to click the Inbox option on the navigation pane [shown with a big blue arrow next to it]. 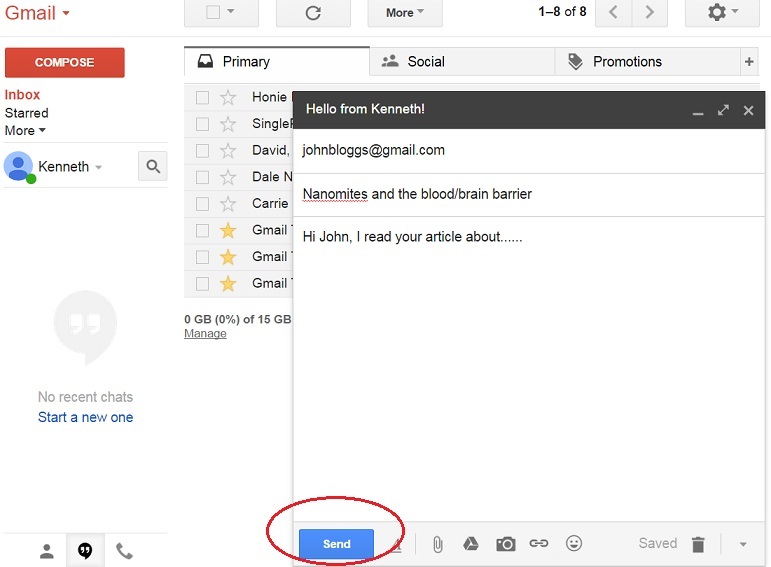 Or…you could click on the ‘Back to Inbox’ button [circled in red]. Either method will return you to the Primary tab where the email you have just read will be shown as grey. The remaining unread emails will still show as white. Despite showing as grey, all the emails are still active. They can be replied to and, amongst other things, they can be ‘starred’ to show they are important in some way. Starring also makes them more visible. To return to the normal, tabbed display, click on the Inbox option in the navigation pane. 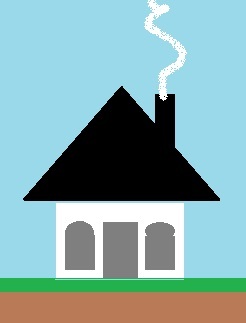 how to do some very basic housekeeping.